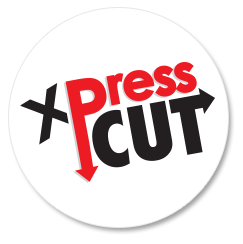 XPress Cut is a polyurethane opaque film, without PVC, plasticizers or heavy metals, as per the Oeko-Tex Standard 100 Class I requirements. It is suitable for heat transfer on cotton fabrics, cotton and polyester and polyester and acrylic garments. Its polyester adhesive carrier allows easy repositioning of the characters accidentally removed. XPress Cut Special is a polyurethane metallized opaque film, without PVC, plasticizers or heavy metals, as per the Oeko-Tex Standard 100 Class I requirements. It is suitable for heat transfer on cotton fabrics, cotton and polyester and polyester and acrylic garments. Its polyester adhesive carrier allows easy repositioning of the characters accidentally removed. XPress Cut Neon is a polyurethane opaque film, without PVC, plasticizers or heavy metals, as per the Oeko-Tex Standard 100 Class I requirements. It is suitable for heat transfer on cotton fabrics, cotton and polyester and polyester and acrylic garments. Its polyester adhesive carrier allows easy repositioning of the characters accidentally removed. XPress Cut Mirror is a polyurethane film covered by a thin layer of metallic PET, without PVC, plasticizers or heavy metals, as per the Oeko-Tex Standard 100 Class I requirements. It is suitable for heat transfer on cotton fabrics, cotton and polyester and polyester and acrylic garments. Its polyester adhesive carrier allows easy repositioning of the characters accidentally removed.